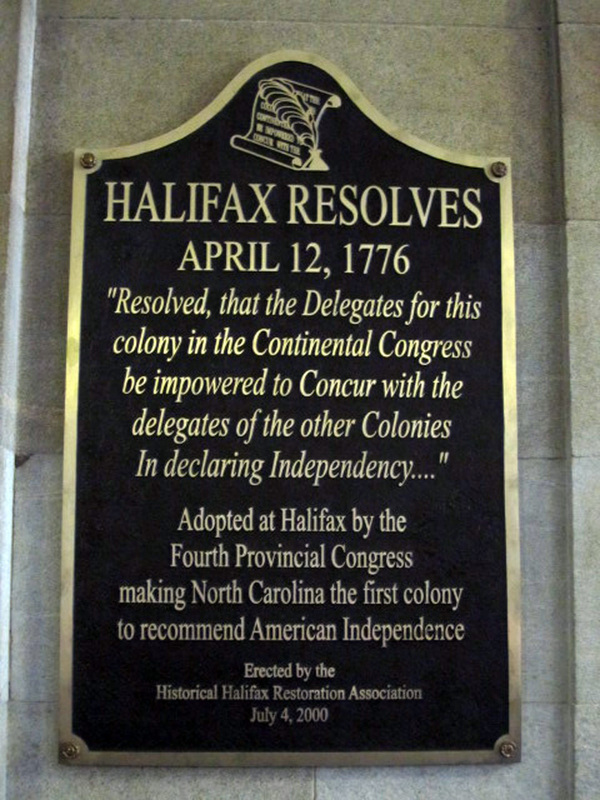 Source: Halifax Resolves Plaque, State Capitol, Raleigh. Photograph courtesy of Natasha Smith. This plaque sits on the wall in the first floor of the rotunda of the North Carolina State Capitol building in Raleigh. 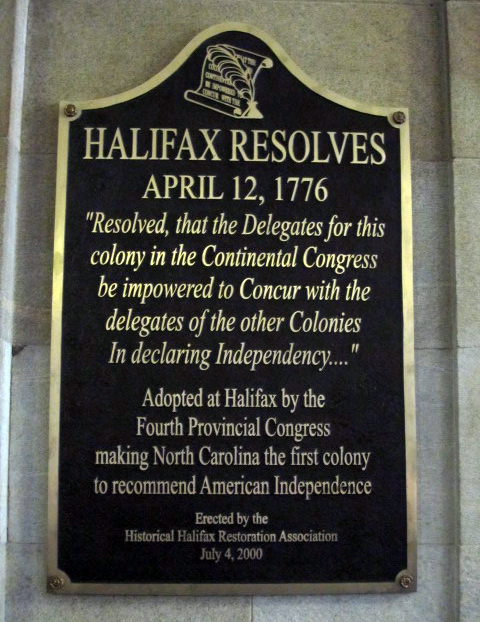 The plaque commemorates the resolution for a declaration of independence from Great Britain advanced by North Carolina’s delegation at the Fourth Provincial Congress at Halifax, North Carolina on April 12, 1776. The plaque is approximately three feet tall by two feet wide, with a single scallop rising on the top edge. An engraving of the declaration in the shape of a scroll along with a feather quill pen is shown in the scallop. Prior to April of 1776, North Carolina was undecided on the issue of independence. However, at the Fourth Provincial Congress at Halifax beginning April 4, 1776, and following close on the heels of the Battle of Moores Creek Bridge, members of North Carolina's delegation sitting on the committee considering violations committed by the King resolved forcefully for declaration of independence from Great Britain. Known as the Halifax Resolves, the resolutions adopted by the Provincial Congress quickly made their way to Joseph Hewes, a North Carolina delegation member in Philadelphia, and helped pave the way for the Declaration of Independence of July 4, 1776. The plaque is located in the rotunda of the North Carolina State Capitol building on West Morgan Street. The plaque is located on the wall in the interior of the rotunda of the North Carolina State Capitol. The interior of the rotunda houses other State Capitol memorials including statuary, paintings, and plaques commemorating significant events and individuals in North Carolina's history.